Download a presentation that discusses today’s post-op treatment concerns, and gives new, effective options for pain management. Patients may not understand that avoiding post-op pain completely may not be achievable. Help them reframe their pain relief goals to focus on restoring normal functionality, so they can return to their job, household, and family. Download a discussion tool that helps explain effective post-op pain relief options to your patients. Help patients create a plan specific to them and their individual health conditions. 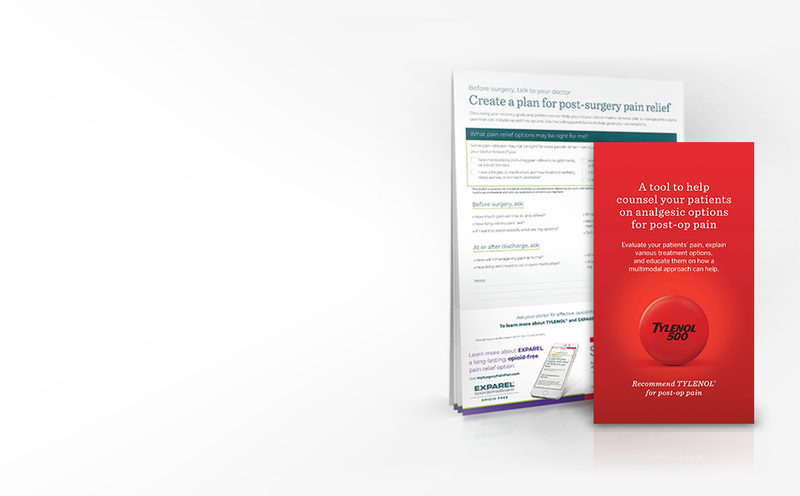 Download a planning tool to help your patients prepare for and personalize their approach to relieving post-op pain. 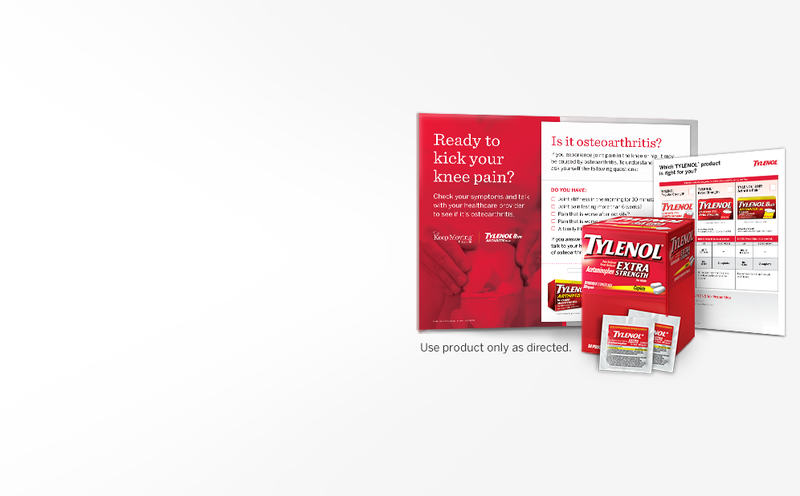 TYLENOL® can be an appropriate opioid-free pain relief choice for many of your patients, both in hospital and at discharge. Visit the Resource Library to explore instant educational downloads for your patients and practice. Get complimentary samples and coupons, condition-focused patient education, and more. REFERENCES: 1. Chou R, Gordon DB, de Leon-Casasola OA, et al. Management of Postoperative Pain: A Clinical Practice Guideline From the American Pain Society, the American Society of Regional Anesthesia and Pain Medicine, and the American Society of Anesthesiologists’ Committee on Regional Anesthesia, Executive Committee, and Administrative Council. J Pain. 2016;17(2):131-157. 2. Qi DS. May LG, Zimmerman B, et al. A randomized, double-blind. placebo-controlled study of acetaminophen 1000 mg versus acetaminophen 650 mg for the treatment of postsurgical dental pain. Clin Ther. 2012;34(12):2247-2258. 3. Centers for Disease Control and Prevention. Prescription opioids. https://www.cdc.gov/drugoverdose/opioids/prescribed.html. Accessed April 18, 2018. 4. Wu MS, Chen KH, Chen IF, et al. The efficacy of acupuncture in post-operative pain management: a systematic review and meta-analysis. PLoS ONE. 2016;11(3):e0150367. 5. Kukimoto Y, Ooe N, Ideguchi N. The effects of massage therapy on pain and anxiety after surgery: a systematic review and meta-analysis. Pain Manag Nurs. 2017;18(6):378-390. 6. Data on file based on a 500-person survey. Pacira Pharmaceuticals. Plan against pain. Opioid addiction and dependence after surgery is significantly higher than previously known. 2016. 7. U.S. Food & Drug Administration. FDA strengthens warning of heart attack and stroke risk for non-steroidal anti-inflammatory drugs. https://www.fda.gov/ForConsumers/ConsumerUpdates/ucm453610.htm. Accessed April 18, 2018. 8. Catella-Lawson F, Reilly MP, Kapoor SC, et al. Cyclooxygenase inhibitors and the antiplatelet effects of aspirin. N Engl J Med. 2001;345(25):1809-1817. 9. Elliott WJ. Drug interactions and drugs that affect blood pressure. J Clin Hypertens. 2006;8(10):731-737.